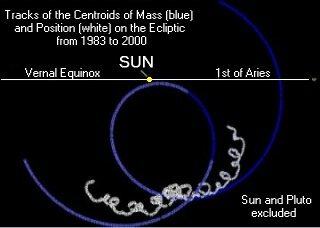 The Heliocentric Line of Position (blue) is the line joining the Sun and the Centroid of Position (CP) of the principle bodies of our Solar System. This centroid is concerned only with position, just pure position, and excludes the Sun itself, and Pluto. The Centroid of Mass (CM) is the same as the centroid of position, except that each body-position counts the-mass-of-that-body times over: that is, if a given body has a mass m units, then the body's position counts m times over when the centroid comes to be computed. The CM is rarely where the CP is. White or light blue – North of the Ecliptic. Gray or dark blue – South of the Ecliptic. The white line through the CM indicates the direction, but not the sense, of its acceleration. The arrowhead on the green vector, also shown, supplies that sense. 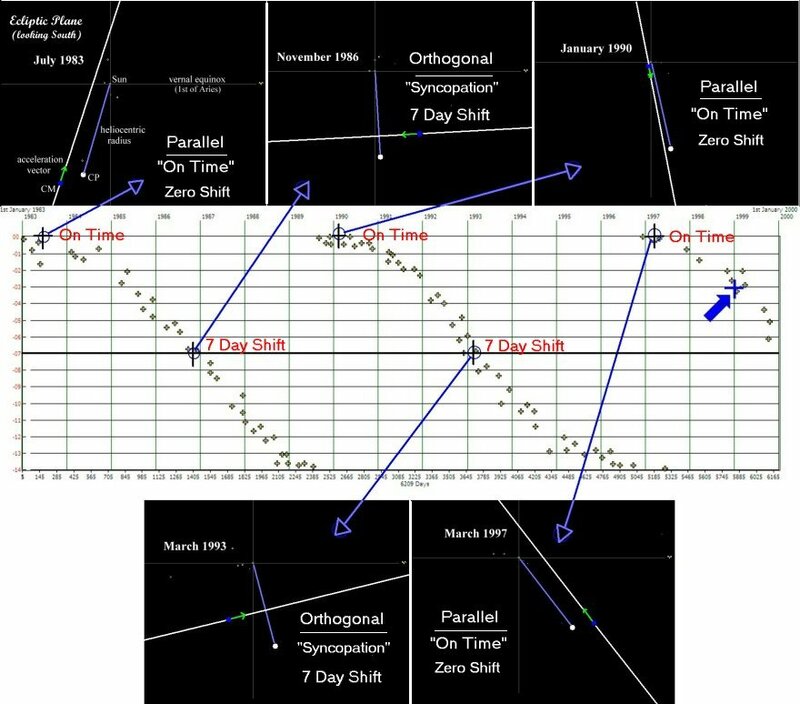 all have no detectable relationship with the Phase Shift. The moments of correlation first noted (shown below) are few. Does the correlation hold throughout, at all times? The answer (subject to the usual scientific disclaimers) is, “Yes, it holds”, and has to do with Directivity.